Our Vision: पाठयेम संस्कृतं जगति सर्वमानवान् ! प्रापयेम भारतं सपदि परमवैभवम् !! Our Mission: Reviving a language, rejuvenating a culture, rebuilding a nation that is Bharat! Samskrita Bharati (founded 1981) is a movement for the continuing protection, development and propagation of the Sanskritam language as well as the literature, tradition and the knowledge systems embedded in it. Samskrita Bharati is a non-profit organization comprised of a large team of very dedicated and enthusiastic volunteers who take the knowledge of Sanskrit to all sections of society irrespective of race, gender, region, religion, caste, age etc. 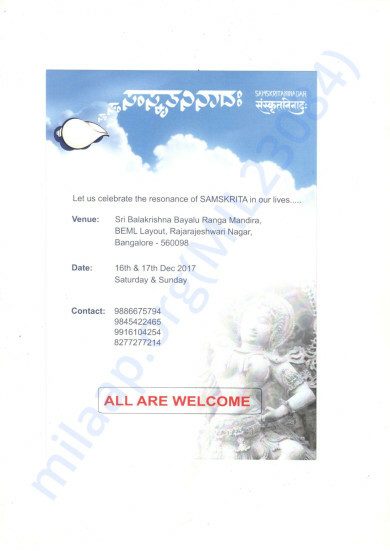 Samskrita Bharati is conducting a event called Samskrita Ninaadah at Rajarajeshwari Nagar, Bangalore to raise awareness about Sanskrit language and to educate people to learn and speak the Mother of all Indian languages, Sanskrit. We propose to raise funds for the successful conduction/ funding of the event. The Last two weeks have been a great organising the various activities towards succesful conduction of the event. The flyer is ready and we have given order for Printout for about 5,000 of such flyers. The Kannada flyer is also on it's way out. Further, the E Invitation is also on way and will be ready in a week's time. Order for Banners and Cut outs have been given for us to place at strategic locations to attract public attention. We expect a footfall of atleast 1000 people in the two days of the event. We have appointed M/s Arrow Enterprises, Bangalore as our Swachtha Partner and they will be taking care of the cleanliness of the place. Another important development has been the video invite is ready and we will be uploading the same. We will upload further developments as we progress towards the event. At the outset, Thank you very much for your Donation. 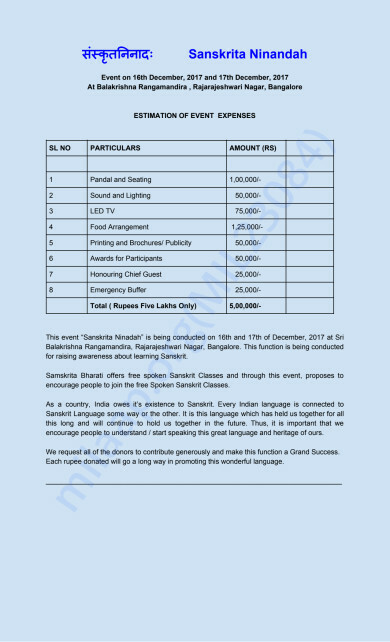 As you are aware that this event is proposed to be held on 16th and 17th of December, 2017, we wish to inform you that we have already booked Ranga Mandira Ground with BBMP for those two days.We have paid the Ground Rent. The next step is to finalise the Pamphlet and Brochure which we are in the process of doing and should finalise before this week ends. We will post the pamphlet online on our Fundraiser Campaign soon. The funds we are using now to withdraw are towards designing the Pamphlets. Though this amount is a very small amount compared to the quantum of expenditure, we will be using the same towards designing the pamphlets. We once again thank you for your help and cooperation in this regard and request you to kindly wait for our weekly updates which we will be posting every Wednesday from now on till the conclusion of this fund raising campaign. We also request you to promote our fundraising page amongst your friends and family so that we achieve our target at the shortest possible time. Thanks for the opportunity, Deepak.